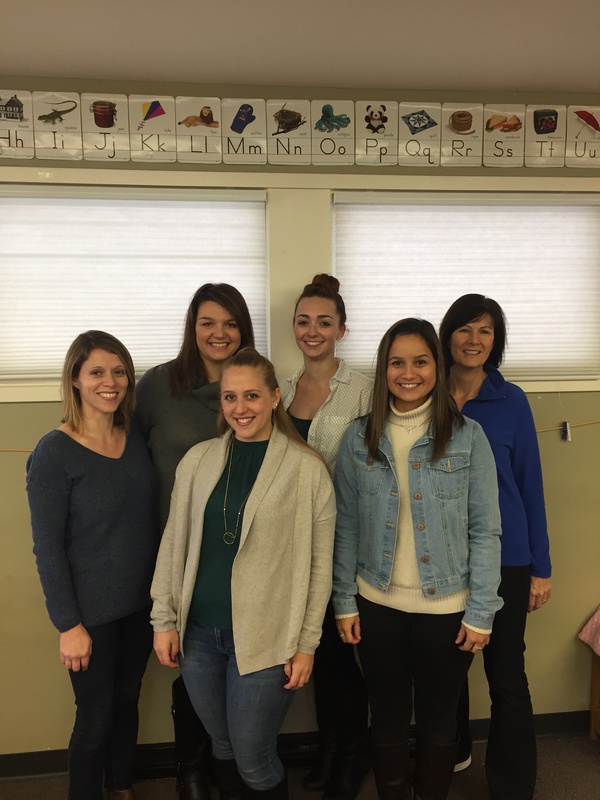 Pentucket Workshop teachers include NECC ECE grads, left to right, Becky Papageorgiou ( 2001), Amy Marsan (2007), Chelsea Brown (2015), Sarina LeClerc (2017), Laura Yepes- current student teacher (2017), and Jeanne Lenzie (1998). When Gail Feigenbaum, coordinator of Northern Essex Community College’s Early Childhood Education Program, visits local preschools to observe student teachers, it’s usually old home week. That’s because so many of the preschool teachers in this area are graduates of the college’s program. Five of the eleven teachers at the Pentucket Workshop in Georgetown, for example, are graduates of Northern Essex, including Becky Papageorgiou of Bradford (a 2001 graduate); Amy Marsan of Haverhill (2007); Chelsea Brown of Haverhill (2015), Sarina LeClerc of Haverhill (2017), and Jeanne Lenzie of Haverhill (1998). Laura Yepes of Haverhill, who will graduate in 2017, is currently student teaching there. “It’s exciting to see familiar faces and I love being reminded of what a positive impact Northern Essex has on pre-school learning in the Merrimack Valley,” says Feigenbaum, who is appreciative of the local preschools who provide practicum learning sites for Northern Essex students. And preschool directors welcome the pool of new talent that Northern Essex provides. “NECC students bring new perspectives in Early Childhood practices and a youthful energy to our seasoned staff. We love our partnership with the Early Childhood Program at NECC,” says Maryellen Lawler, assistant director of the Pentucket Workshop. Northern Essex offers associate degrees in Early Childhood Education, Elementary Education or Liberal Arts: Middle/High School Teaching. All programs integrate classroom learning with practicums or field experiences that provide real-world experiences. For more information, contact NECC Enrollment Services, admissions@necc.mass.edu or 978 556-3700 or visit the website necc.mass.edu.